Pest Size: Smaller than a cat. Hazardous Level: Squirrels carry parasites (like ticks and fleas) and diseases (such as Hantavirus Pulmonary Syndrome). Contracting HPS is rare in Ontario but it can lead to death if left untreated. Squirrels rarely carry rabies as they are small, and most bites from another animal (such as a raccoon or skunk) will kill them. They are also quite evasive, meaning they would be difficult to get bitten in the first place. Multiplication Level: A squirrel can carry one or two babies. Squirrels can damage your home by chewing holes in the exterior and nesting in attics and walls. They can chew wires and damage insulation. There are a couple of different spots that squirrels like to invade your house in stove or bathroom vent pipes and the most popular spot your attic. 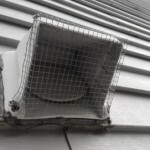 Vent pipes get weathered and brittle which can give easy access to pipes where squirrels like to have babies. Anypest will clean the pipes and all debris, feces and sanitize vent pipe to protect you from harmful disease. 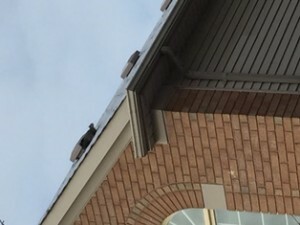 Attics are the most popular spot where squirrels chew through roof vents or fit through loose pieces of soffit. If you sleep close to the ceiling, you will often be awoken many times by squirrels chewing or dragging food into your attic. Anypest will do a thorough inspection of your attic to find out if there are babies and assess the damage (chewed wires, feces , insulation damage) in most cases a one way door is installed to humanely evict the animal. 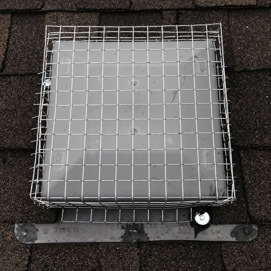 Roof vent covers can also be installed to insure the animal or future animals do not get back in. Anypest can also spray a Eco friendly sanitizer to kill germs bacteria and disinfect soiled areas. Are squirrels hazardous to humans? Yes. Squirrels carry parasites and diseases which can be contracted by humans and pets. Chances are pretty slim you will catch anything, however there is always the potential. A more common thing to catch are ticks that Squirrels may bring in. Squirrels can also chew on wiring which could potentially cause fires or power outages. What are their breeding habits? Do the multiply quickly? Squirrels breed twice a year and maintain multiple nests. Squirrels can live up to 20 years. How do I know I have a Squirrel living in my attic? You will often hear clawing and scratching noises, particularly late at night or early in the morning when your house is at its most quiet. If you examine the area with a flashlight you might see squirrel droppings, as well as food, such as walnuts, seeds and pine cones lying around. Generally it is just one squirrel who will nest in your attic (unless they have babies) however you might hear squirrels playing and chasing each other about as well. 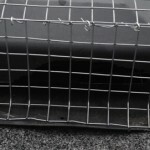 What can I do if I have a Squirrel infestation? It is recommended to seek the services of a trained Pest Control professional to eliminate pests for thorough results. The sooner you call someone like Anypest, the less risk of damage your attic will suffer. You can try things like banging on your ceiling, placing radios in your attic. Eventually squirrels will grow accustomed to these things and no longer fear you. As squirrels live up to 20 years, it's just better you call us, as banging on your ceiling every couple of hours is not a war that you are going to win. Squirrels are really tiny, can they cause much damage in my attic? 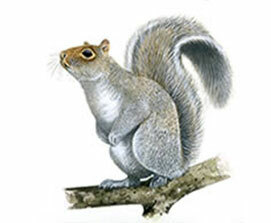 Electrical Wiring – A Squirrels' front teeth are constantly growing, and chewing is a way they wear their teeth done. Unfortunately, once they are in your attic, one of their favourite items to chew are electrical wires. Each year squirrels are responsible for many house fires in Ontario. Structural Wood – Squirrels also love to chew wood like it were a tree branch or a pine cone. They can chew structural wood down to toothpicks, causing parts of your attic to collapse. 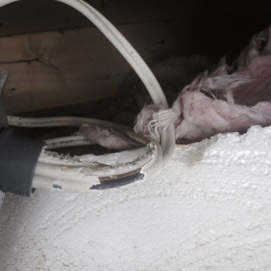 Insulation Damage – Squirrels love to build nests out of the insulation throughout your attic. The shredding of the insulation makes it ineffective, which can raise your heating bills considerably in the winter. Odour – Squirrels don't have little toilets that use. Nope, they will pee and poop wherever they please, meaning your attic will quickly fill up with feces and urine causing your entire home to take on a fowl musty smell. Water Leaks – When squirrels chew on the exterior of your home to get in, it allows water to seep in during rain storms. This will cause damages to your ceiling and walls that are expensive to repair. Rot - I once visited my Dad in Ancaster who complained about his front porch smelling. We took a look underneath and found a three foot pile of walnuts that had been collected over the years. The rotting walnuts at the bottom of the pile were leaning against the porch which caused considerable wood damage. I wish we had taken a picture at how comically large the walnut pile was, however this was before the era of cell phones. That squirrel was prepared for Y2K panic that was occurring at the time.